Honestly, we don't have a new cake every evening. My wife wants you to know that there have been a lot of dinner parties this week. Here's a chocolate cake she made. It's kind of backwards because there are no eggs in the cake, but eggs in the frosting. If you would like to win this postcard drawing, just comment and email a delivery address like it says here. I drifted over from DrawMo! - I was curious about your art. I enjoyed looking at the 'parts of my dog' series, my favorite was #6. When is your wife making another cake? I'll be there. Very nice drawing - I want it! I want it! 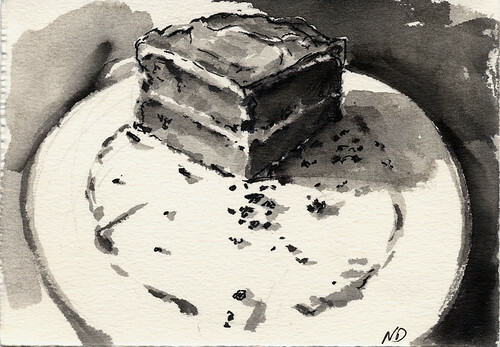 It's okay—you have to keep drawing cakes until I win one. Perhaps, this slice will be mine? Doesn't it give you a warm, fuzzy feeling of security to know that there's a big slab of leftover cake waiting for you? Break out the dice cup...roll, roll, roll, roll... and the number is two. Congratulations ArtByLmr (art by lemur?) It's weird with six sides on the dice I only had to roll once. India... I'm not sure about cakes, but maybe we'll have pie for Thxgiving.